Our team of Staff and Educators are dedicated to delivering the highest quality care and and early childhood education to your child. Browse through our profiles or your welcome to come in and see us. We would love meet you! I became an Early Childhood Educator because from a very young age I always loved babies, so it seemed like a natural progression for me to pursue a career in Early Childhood Education. 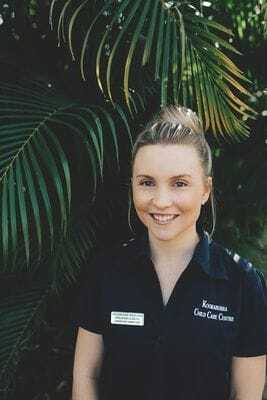 I came to Kookaburra as a work experience student in 2002 whilst studying my Certificate III in Children's Services and was offered a full time job at the Centre. 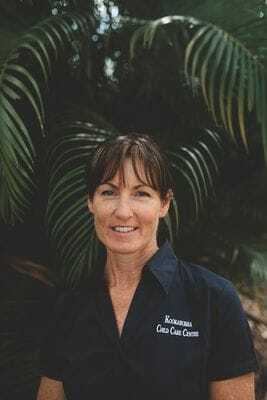 During my 16 years at Kookaburra I have worked as an Assistant Educator, Lead Educator, Assistant Director and now Director and worked in every room within the Centre. I also studied my Diploma and Advanced Diploma in Children's Services during this time. I love working at Kookaburra because it's such a fun and enjoyable place to be. We are like a big family and I have made some lifelong friends during my time at the Centre. Getting to know the children and their families is so rewarding and as a parent myself now I can appreciate how important the relationships between families and our staff is. I became an Early Childhood Educator because, I was lucky enough to get a school based traineeship. I loved coming to work every Wednesday and was so happy when I was offered a full time job. I love Kookaburra because it is full of beautiful children and wonderful staff! It feels like one big happy family. I became an Early Childhood Educator because I love educating and caring for children, and how their individual personalities make every day unique and special. I love working at Kookaburra because we have such beautiful natural play environments, we have such long term staff and I feel as if we are all a part of one big family! I became an Early Childhood Educator because when I volunteered for 2 days at Kookaburra I instantly fell in love with the children and the Centre! Turn the clock forward 20 years and I still love coming to work every day! I love the relationships you build with the children and their families that last long after they've finished at Kookaburra and the amazing workmates who have become lifelong friends. I became an Early Childhood Educator because I love children! They are so easy to educate, you can teach them 5 different things just by doing one basic activity. If it looks pretty, noisy or if you join in with them they think it's amazing! Children are like sponges and I love teaching them and then seeing the results. The reasons I love working at Kookaburra are that the staff have all been at the Centre for so many years, we all support each other professionally, the children and their families are often with us for many years as two or more siblings will attend the service and this means the parents are well known by all the staff and feel like a part of the Kookaburra family. I became an Early Childhood Educator because growing up in a big family and being the oldest one, I was always looking out for and caring for the younger children. This made me sure I wanted a career working with and educating children. It is such an amazing and rewarding feeling to know that you are supporting children through some of the most important years of their lives. What I love about being a part of Kookaburra is the amazing play environments the Centre offers for children to learn and explore in, the fact that the Centre is a Community Based Not for Profit organisation so all the funds made go back into the Centre for improvements and resources for the staff and children, and the way the Management Committee take care of the staff and make us feel valued and supported as if we are all part of the Kookaburra family. 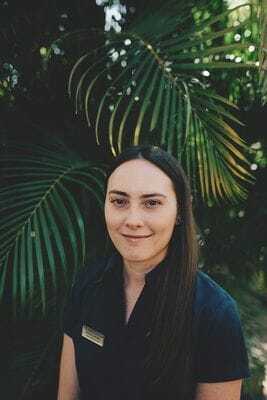 I became an Early Childhood Educator because I was studying Early Childhood Education at high school when an opportunity came up for me to study my Certificate III in Children's Services at Kookaburra. So I completed my Cert III before leaving high school and was offered a full time position at Kookaburra once completing year 12. I have stayed at the Centre ever since and am currently studying my Diploma. I love that working at Kookaburra means we get to have fun every day with the other Educators and the children and their families. Not a day goes by that the children don't make me laugh or smile! I became an Educator because I love children and I love watching them grow. I love working at Kookaburra because its like having another family. The staff have been here for a long time and everyone loves being here. This was something I noticed straight away when starting at Kookaburra. I became an Early Childhood Educator because I have always enjoyed working with kids from a young age and love watching children grow and learn in the first few years of life. I love working at Kookaburra because the staff know all the families very well and it's like one big family. I became an Early Childhood Educator because I developed a passion for working with children while I was completing the practical side of my Certificate III in Early Childhood. I knew this was the career path I wanted to pursue as I loved helping them grow and develop both physically and cognitively. I find watching the fascination in the children's eyes when they learn or achieve something for the first time is very rewarding. On commencement of my time at Kookaburra I felt privileged to be welcomed into the Kookaburra family by staff, children and families. The unconditional love I receive at work from the children is a great incentive to come to work every day. 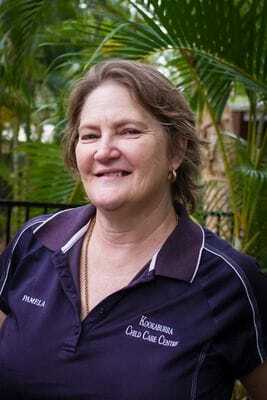 I became an Early Childhood Educator because I used to work as an office Clerk at Kookaburra after school. When I finished year 12 I did a few days a week with the children and was then offered a full time position at the Centre as an Educator. I knew this would be a rewarding career surrounded by great people! I love working at Kookaburra because I get to see each child grow into a beautiful little person. Knowing that I've helped them learn and achieve great things along the way is very rewarding. I became an Early Childhood Educator because I knew from an early age that I wanted to work with children. A career in Childcare was very appealing to me because I read that the first five years of life is the most important. I felt then that I could really make a huge difference to a lot of children's lives and knew it would be a very rewarding career. I love working at Kookaburra because it has such a strong sense of community. I have seen whole families come through the Centre and have watched them continue to grow through the years I have been here. I also love coming in of a morning and getting greeted with hugs, massive smiles and so much excitement for the day to come! I became an Early Childhood Educator because I made the choice whilst still at high school that I wanted to work with young children. 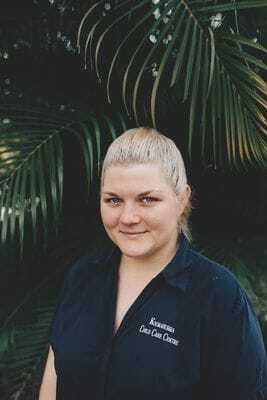 I started working at Kookaburra as a school based trainee one day per week. Once I finished studying my Certificate III in Children's Services I worked part time for a short time before being offered a full time position. After working on a full time basis and enjoying my role I wanted to further my knowledge and career opportunities, this is when I decided to begin studying my Diploma. 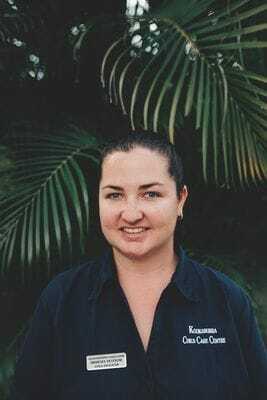 I love working at Kookaburra because it's like a great big family and so welcoming to everyone. I love being able to help the children grow and learn new skills every day. I also love seeing all the children and families so happy with the care they receive. I became an Early Childhood Educator because I always loved working with children ever since I graduated from University back home (Cebu). When I migrated to Australia there was an opportunity for me to be an Early Childhood Educator through a training program provided by the Australian government. 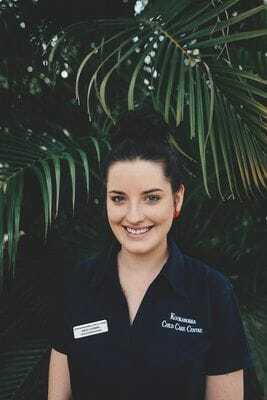 This program provided me with the chance to work at different Childcare Centres in the Mackay region and during my placement at Kookaburra I was offed a full time position. I love working at Kookaburra as they provide a different range of educational activities for the children. They also have an excellent team of Child Educators who are so friendly and deal with the everyday challenges in a professional manner and set daily goals for each child to work towards. I became an Early Childhood Educator because I've always loved being around children. I've also always wanted to be a part of something bigger than myself. I love working at Kookaburra because we are like a big family. If we need ideas we all brainstorm together to provide the children with more interesting and challenging experiences. I also love how our Educators have been a part of the Centre for so many years. I became an Early Childhood Educator because before graduating high school I knew I wanted to have a career working with children. I worked very hard whilst in high school to obtain my Certificate III in Children's Services with the goal of obtaining a position as an Early Childhood Educator once I finished school. Thankfully I was able to get a position at Kookaburra and I wouldn't have it any other way! I love working at Kookaburra because it has a wonderful atmosphere and is such a beautiful Centre full of amazing children and staff. I love coming to work every day and seeing my 'other' family, my KCC family. I became an Early Childhood Teacher because I have always wanted to be a teacher ever since I was a little girl. It wasn't until I worked in Child Care before university that I discovered my passion for Early Childhood Education. I love working at Kookaburra because of its lovely natural outdoor play spaces and home-like indoor play spaces. The staff are like a big family and make everyone feel welcome and supported. I became an Early Childhood Educator because I knew that this was the career I wanted after finishing school. I applied for an Assistant position at Kookaburra whilst still at school and was fortunate enough to be offered the position. After completing my Certificate III in Children's Services I wanted to further my career so I went on to study both my Diploma and Advanced Diploma in Children's services. I have enjoyed working in various roles in all the rooms throughout the Centre over the years. I love the beautiful natural outdoor play environments, the dedication of all the staff and the fact that Kookaburra is a Community Based Not for Profit organisation. I became an Early Childhood Educator because I love children and seeing there happy, bubbly personalities each day. I love working at Kookaburra as it feels like a second family to me. I love working as a part of the Kookaburra team and I love seeing the children learn and grow. I became an Early Childhood Educator because I have a passion for working with young children and believe that quality early childhood education is paramount in developing a lifelong love of learning. I love working at Kookaburra because we are a team, children and Educators, of mixed personalities that share our knowledge and skills with each other. We are curious and enthusiastic about learning and teaching and we accomplish all this through play. 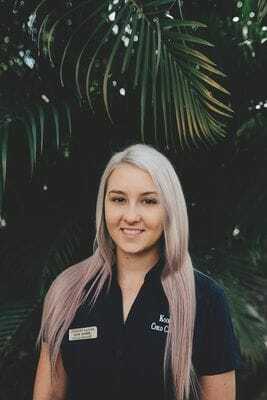 I started working at Kookaburra because I had just graduated year 12 and was looking for fulltime employment when the role of an Office Clerk at Kookaburra became available. Perhaps still unsure of what career path I wanted I applied for the position and got it. I am very thankful I was given the opportunity to be a part of Kookaburra and couldn't be happier with my career choice. Over the years I've progressed from Admin Clerk to Office Manager and in collaboration with our Director, Educators and Parent Management Committee have helped implement important upgrades to our systems that have helped make Kookaburra the amazing centre it is today. I love working at Kookaburra because I find it very rewarding to work in such a loving and supportive environment. My fellow colleagues are wonderful people to work alongside and I have made lifelong friends with them (both past and present staff). I love seeing all the different relationships that are able to be formed with our families/children at the Centre. I couldn't imagine my life without Kookaburra, the staff, the families, the children and all the wonderful memories that have been created over the years. I became a cook at Kookaburra at first because the hours were great, I love to cook and I got to be around my grandchildren. However now I love talking with all the children at the Centre about what's for lunch or morning tea as well as hearing their stories. I love working at Kookaburra because of all the friendly staff and the daily challenge of providing nutritious healthy (and yummy) meals out to the children. I became an Early Childhood Educator as I love being able to teach the younger generations during their most crucial part of life. I love working at Kookaburra as each educator ensures every child feels safe, comfortable and has lots of fun whilst at our Centre. I became an Early Childhood Educator becasue I have always loved kids! Being the edlest of three children I picked up the bug early! I originally started working in graphic design, but I came to realise that it wasn't a fullfilling career. I looked into becoming an Early Childhood Educator and haven't looked back! I love working at Kookaburra because the staff are amazing! We balance each other out and support each other whenever its needed. I'm so lucky I became a part of the Kookaburra family.